A Thought Shared ....: Leishmaniasis..
Every day, I get news from an RSS feed. Every day, I see some report about a person or group of people who are needlessly suffering. From the many pictures I could have picked, this one seemed the most poignant. It was taken back in 2002, and shows a seven year old Afghan girl suffering from a disease called Leishmaniasis. It is spread by sand flies, and is a direct result of bad sanitation. Take a good look. This is no freak show picture. 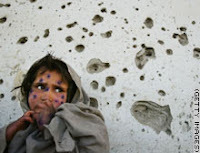 This is a seven year old Afghan girl, called Mohboba, sitting against a bullet riddled wall, awaiting treatment at a clinic close by, her face badly disfigured. Even if the disfigurement didn't hurt, can you imagine the psychological damage that she must have? This could be your little girl, but aren't you glad that your daughter doesn't look like this? Can you see any joy in Mohboba's eyes? Do you think that she has ever had the joy of opening a present, watching a Disney movie, going out on an Easter egg hunt? She doesn't go to sleep at night to the sound of a lullaby sung by her mother. This little girl hears gunfire and bomb blasts. Can you see the wall behind her? She looks this way because some idiots decided that war was more important. She is a casualty of greed and power. She is one of a long line of people who have had to grow up in a war torn hell hole. The people who make the decision to go to war don't live on her street. They make sure of that. This is what happens when somebody decides that their 'god' is better, more worthy than somebody else's. By the way, the disease is curable, but much of the disfigurement stays.